A good number of reviewers say that they will recommend the Jordan Melo M13 to those who are dear to them. Many wearers, especially the more style-conscious ones, love that the colors on this shoe are usually bright. Those who have worn and played in Jordan Melo M13 shoes love the fact that they are light. This is perhaps the effect of using the fit system. Some buyers think that Carmelo Anthony’s M13s are reasonably priced. In fact, a tester thinks that its price is actually one of the shoe’s best features. The FlightSpeed cushioning system might have delivered its magic because a good number of wearers feel that this shoe is among the most comfortable ones that they have ever worn. This is also the case with the 33rd iteration of Michael Jordan’s signature sneakers. The Flight Web fit system might have been a good addition to the shoe because a handful of reviewers think that this shoe has just the right amount of snugness. 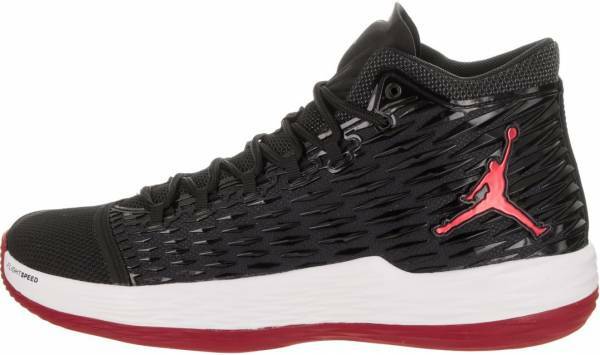 Generally, reviewers say that these Jordan basketball shoes run true to size. A considerable number of testers feel that this shoe is definitely one of the least supportive shoes that they have ever played in. The same can be said of Kevin Durant’s 11th shoe. Some testers have complaints about the traction of the Jordan Melo M13; one of them even went as far as shelving the shoe because of traction issues. While the mesh upper delivers comfort and breathability, some testers feel that it’s just not durable enough for aggressive plays. The Jordan Melo M13 is a fairly decent and practical shoe. It is cheaper than the previous release in Carmelo Anthony’s line, but the price cut appears to come with some performance drawbacks. It is reported to have issues when it comes to traction and support. Still, many buyers want to have a pair of these basketball sneakers because of their stylishness. Indeed, one gets to win some and lose some with this one. If you are a guard, I don't think you should get these. The Jordan Melo M13 is a pretty average shoe in my opinion, which is saddening as many people actually like the look of this shoe. I gotta say this is one the weakest shoes in the support area that I’ve played in so far. Carmelo Anthony is one of the most tenured among all Air Jordan athletes. The thirteenth release in his line comes with technologies that aim to deliver comfort, explosive responsiveness, and secure lockdown. The upper is made of soft mesh that provides the necessary motion flexibility especially to more aggressive players. Integrated into the upper is the Flight Web fit system that provides a more secure lockdown. In the midsole is the FlightSpeed cushioning system that provides explosive energy returns for a powerful first step and well-supported jumps. Cushion. The FlightSpeed cushioning system of the Jordan Melo M13 is perhaps the shoe’s crowning technology. It is composed of two of the brand’s most effective breakthroughs: the Zoom Air and the Flight Plate. The Zoom Air uses tightly stretched tensile fabrics to cushion impact and deliver high energy returns. Basically, the fabrics compress upon impact; then, they immediately go back to their original form, producing explosive energy in the process. The Flight Plate basically enhances the performance of the already effective Zoom Air. What this moderator plate does is evenly distribute the energy produced by the Zoom Air unit. This results in a more balanced out experience of impact absorption and energy explosion. Traction. The outsole of the Jordan Melo M13 is made of rubber that features horizontal grooves. The shoe’s grip is enhanced by adding several raised points all over the outsole. Length and Width. This shoe from the Jumpman is said to run true to size. Those who wear thick socks may want to go half a size up for a more comfortable ride. Lockdown. The upper of the Melo M13 is made of mesh that has the company’s Flight Web system integrated into it. This technology provides a more secure lockdown for the player through the use of webbed straps in the midfoot area. These straps are integrated with the laces, giving the shoe the flexibility needed to sway with the wearer’s movement. The upper of the Jordan Melo M 13 is made of breathable mesh. It has stylish kurim overlays on the lateral side. The shoe’s breathability is enhanced further by its tongue that is made of open-cell mesh. The toe cap has fuse overlays to give it more durability. The same is true for the seams. The Melo M13 is a monochromatic offering from the Jordan brand. The lateral side of its mesh upper has kurim overlays that make the shoe extra appealing. A prominent Jumpman logo is also on the lateral side of the shoe. The upper part of the left tongue has the Jumpman logo, the left has the Melo logo. The Jordan Melo M13 arrives in the following tonal hues.